This page, Above Ground Oval Installation, is part of an ongoing ebook project that started here. We have made it to the specifics about oval installations. What makes these pools different than round pools? It's all in the side braces. 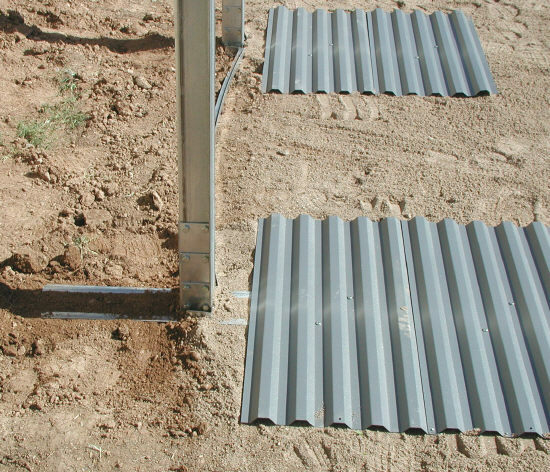 The side structures that can add hours or days to the installation time. Every make and model of above ground pools have a different set up for their side braces. It would be impossible to cover them all here. There are some things common to them all, some basic steps you should take with all oval pools. Leveling the ground is the first step. I will discuss leveling in more detail a little later. For now just keep in mind the entire pool area needs to be perfectly level. It is a good idea to add a couple of feet extra all around the pool and level that too. The only difference at this point between a round pool and an oval pool is when to pack the ground and do the final smoothing. Since setting the side braces on an oval pool can involve a lot of digging you may want to hold off on the ground packing until the trenches are dug and the braces set. The final smoothing can wait also because setting the braces will disturb most of the ground anyway. So just level the ground and get right to the hard part, setting the side braces. Oval pools are constructed in three basic ways. There are the profile pools, pools with no angle bracing on the sides and pools with the angles. The third design has steel straps that connect the braces from side to side. Profile and angle brace pools can be sold with or without straps. Pools without straps are designed that way to allow for deep ends. Pools with straps are for flat bottom installations only. 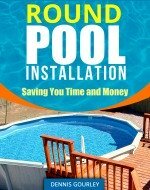 Oval pools with straps are generally much easier to install than those without. The straps hold all of the outward pressure in an easy to install fashion. Without the straps pool designers have gone nuts inventing ways to deal with the pressure. In my opinion Doughboy had it right 30 years ago and they use the same basic setup today. Other makers have invented brace setups that are a nightmare to install. Pools with straps usually involve less digging and having something to connect the two sides together which takes away a lot of the guess work. It is extremely important when you assemble your braces to follow the instructions closely. Some setups will have a million nuts and bolts of different sizes. They all have a special purpose so take your time and get them where they belong. When working with straps I will lay the entire brace system out and connect the two sides with the straps. I will even use the bottom rails, between the side braces, at this initial stage. Some oval pools have pressure plates that connect together down the side of the pool. These should be connected also. It is very important at this point to get the entire brace framework square. I use a string line down one side of the pool, just inside the braces. Set two stakes a few feet past the end braces and connect them with a string. All of the braces on one side should now be set about a quarter inch away from the string. Now you can take a tape measure from the outside brace on one side to the opposite outside brace on the other side. Now do the opposite corners and adjust the brace assembly side to side until both of these measurements are the same. With the framework square the braces can now be set. Many pools require trenches for the braces to sit into. This will probably mean taking some of the pool back apart. Carefully mark where each trench needs to be before moving anything. You will probably need to disconnect the straps and pressure plates in order to move the braces aside to dig the trenches. 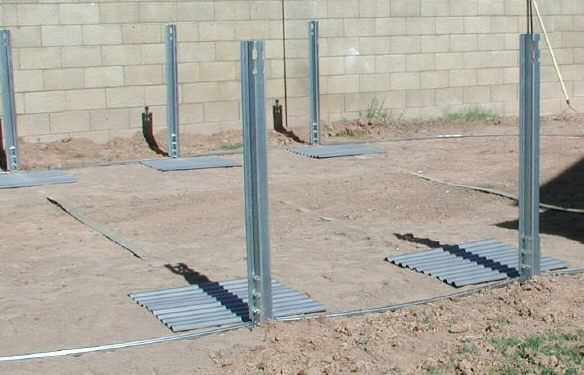 Carefully level your trenches front and back before putting the brace assemblies into place. Most pools will call for a block in the back of the trench. This is very important. It is also important that all of the blocks are set at the exact same level. Every oval pool has pressure plates. They use the weight of the water to hold the braces straight. Pay close attention to the instructions for proper placement of these plates. Some pressure plates will connect to each other down the side and some will just connect to the brace channel. Some pressure plates will lay at ground level and some will be sunk down. Sometimes the brace assemblies can be backfilled and tamped before the pressure plates are used and some need the plates as part of the process. The bottom rails are similar to the pressure plates. Some of them need to be installed as you are setting the braces and some can easily be attached after they are all set. When locating the bottom rails for the sides of your oval be be sure you have the right ones. Oval pool bottom rails will usually come in three sizes. They will be the end rails, the transition rails and the side rails. Some rails are color coded with paint while others have numbers either stamped or painted on them. Separate all of these rails before using any of them. These pages show photos of oval pools being installed.